Miss Piggy's Version Of Global Warming: What About Me? : Krulwich Wonders... Here's a new way to think about global warming. 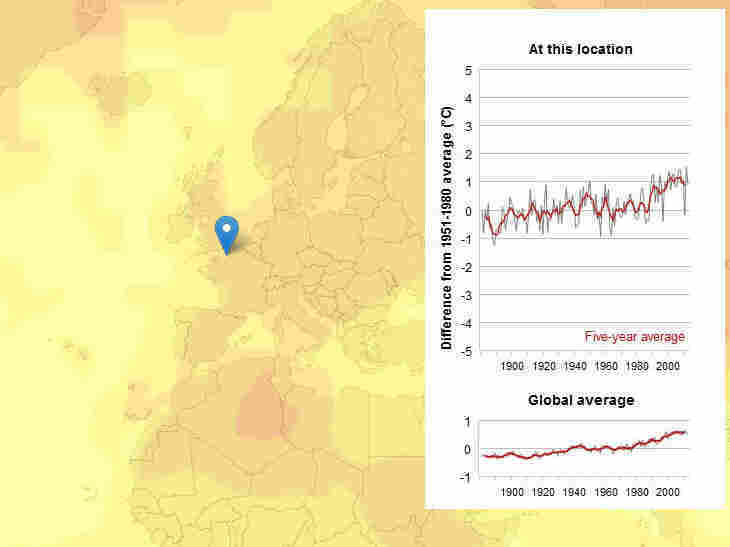 An interactive map plots how temperatures have changed in any region on the planet since the early 1950s. Miss Piggy's Version Of Global Warming: What About Me? What about me? What about where I live? Or where my grandma lives? Or the North Pole? Or Siberia? What if I could take my cursor, plop it onto any place on Earth and find out what's happened to temperatures right there. Click! And a graph instantly registers how much temperatures have changed in that very region since the early 1950s. You can click anywhere you please, on deserts, oceans, island chains, mountains, on places you love or dream of, and discover if things have been warming up or cooling down, and by how much. Some places, I noticed, have gotten colder. But not many. It's easy to do. Go ahead, give it a whirl. This graphic appears on New Scientist's website. It was built by Chris Amico and Peter Aldhous, with help from Robert Schmunk from data produced by a team at NASA's Goddard Institute for Space Studies, whose offices, as it happens, are located not far from the Greek diner in New York City that you see featured on Seinfeld. The graphs and maps all show changes relative to average temperatures for the three decades from 1951 to 1980, the earliest period for which there was sufficiently good coverage for comparison. This gives a consistent view of climate change across the globe. To put these numbers in context, the NASA team estimates that the global average temperature for the 1951-1980 baseline period was about 14 degrees Celsius. The analysis uses land-based temperature measurements from some 6,000 monitoring stations in the Global Historical Climatology Network, plus records from Antarctic stations recorded by the Scientific Committee on Antarctic Research. Temperatures at the ocean surface come from a measurements made by ships from 1880 to 1981, plus satellite measurements from 1982 onward. Surface temperature measurements are not evenly distributed across the globe. So the NASA team interpolates from the available data to calculate average temperatures for cells in a global grid, with each cell measuring 2 degrees latitude by 2 degrees longitude. The analysis extrapolates up to 1,200 kilometres from any one station, which allows for more complete coverage in the Arctic — where monitoring stations are sparsely distributed, but where the warming trend is especially strong. The NASA team also corrects the data to remove local heating caused by dense human settlements — a phenomenon known as the urban heat island effect. Temperature stations in urban areas are identified by referring to satellite images of the light they give off at night, and their records are adjusted to reflect the average trend of nearby rural stations.